Regulator watch by d.freemont Swiss watches. Unique limited production affordable timepieces. The Regulator's unique appearance, with the prominent hour hand, gives the wearer instant recognition of the time… and when necessary the exact time, by consulting the minute hand. 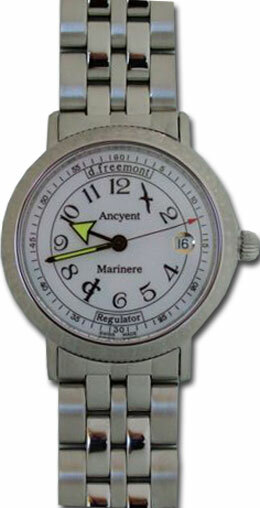 As with all d.freemont watches, accuracy is the principal focus. The day your watch is prepared for shipment to you, d.freemont personally makes the final adjustment to your watch. The Swiss certification board relies upon the COSC standard that a mechanical watch must not lose more than 4 seconds per day nor gain more than 6 seconds per day. d.freemont sets your watch to gain between 2 and 5 seconds per day, never to lose time. 5 ATM – 150 ft.
Production is limited. Each case is numbered. "Nothing more Noble than Kindness"
is engraved on the view back. Strap color may vary from illustration. *Payment plan is valid for US and Canadian orders only. papers and certificate of accuracy. d.freemont watches are timed just prior to shipping... a copy of the actual computer setting is included. Your name will appear on the print-out along with the serial number of the watch. Each watch comes in a gift bag with all warranty and papers. We always choose the top of the line ETA movements which feature shock protected, 28,800 beats per hour movements. d.freemont Watches are truly collectible - limited production. d.freemont watches are calibrated to the Fleuier standard ( 0 to + 5 ) seconds per day. Only the original has sequential numbers the others are not sequential and may bear any number between 301 and 900. "I want to personally thank you for your first rate service and delivery of my extraordinary new Regulator timepiece! This is my first - and certainly not my last - D. Freemont timepiece. Your thoughtful attention to detail to every aspect of manufacturing, inspection and delivery of this timepiece is very evident! 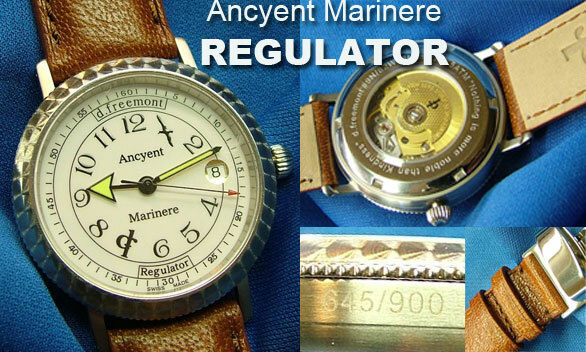 I ordered my Regulator with the high grade, supple, black leather strap with the form fitting deployant closure. I love the decorative touches on both the bezel and the rotor. The dial is stunning, and the generously luminescent hands are easy to read in any light. It is a wonder that you can manage to sell such a fine timepiece at such an affordable price! Your letter of thanks was a very nice personal touch, as well. “Thanks for such excellent service and an excellent product at a bargain price.